Marcus Henry Kellogg (left) was born on March 31, 1833, in Brighton, Ontario, Canada. He was a civilian newspaper correspondent who was killed with Custer’s column during the Battle of the Little Bighorn and buried on Last Stand Hill. John Dolan (right) died at Fort Myer, Virginia, on March 31, 1922, and was buried in Arlington National Cemetery. He was a Private in Company B who was not present at the battle due to detached service. James W. Butler was born on April 1, 1844, in Limerick, Ireland. He stated he was born in Riverton, New Jersey, when he enlisted, but both his pension application and his death certificate listed Limerick, Ireland. He was a Private in Company F who was not present at the battle due to detached service. Philip McHugh died in Allentown, Pennsylvania, on April 1, 1910, and was buried in Immaculate Conception Catholic Cemetery there. His gravestone has March 31 as his date of death, but all references state April 1. He was a Private in Company L who was with the pack train and participated in the hilltop fight. Edward Settle Godfrey (left) died in Cookstown, New Jersey, on April 1, 1932, and was buried in Arlington National Cemetery in Arlington, Virginia. He was an 1863 graduate of the United States Military Academy at West Point who was the First Lieutenant for Company K. He commanded that company during scouting and the hilltop fight. Charles Clinton Barnett died in Anacortes, Skagit County, Washington, on April 3, 1935, and was buried there in Grand View Cemetery. He was a Private in Company G who was not present at the battle due to detached service. William Frank died on April 6, 1880, in Baltimore, Maryland. His burial location has yet to be discovered. He was a Private in Company B who was with the pack train and participated in the hilltop fight. John Curtis Hall died in Warsaw, Indiana, on April 6, 1908. He was a Private in Company D who participated in the hilltop fight. Herbert H. Arnold died on April 6, 1929, in Meriden, Connecticut, and was buried there in Walnut Grove Cemetery. He was a Private in Company C who was not present at the battle due to detached service at Fort Abraham Lincoln, Dakota Territory. Charles Ackerman died at Fort Snelling Minnesota, on April 6, 1930. He was buried in the Forest Cemetery, which is now Forest Lawn Memorial Park in Maplewood, Ramsey County, Minnesota. He was a Private in Company K who was not present at the battle due to detached service at the Powder River Depot. 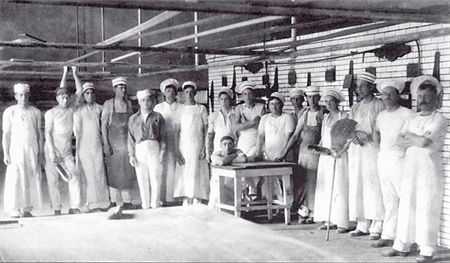 The Training School for Bakers and Cooks was established at Fort Riley in 1905 to teach soldiers about food preparation, including methods for preparing food in the field. Bakers were taught how to make ovens in the field in order to bake bread. Bromwell may be in this U.S. Army photograph. Latrobe Bromwell was born about 1847 in Frederick County, Maryland, the son of Louisa E. Meriweather and Hosea J. Bromwell. He served in the 11th Maryland Infantry during the Civil War. While with the Seventh Cavalry, he was a Private in Company E who was not present at the Battle of the Little Bighorn because he became ill on Rosebud Creek and was sent back to the Powder River Depot. Those in his company who went to battle were killed. He was the instructor in cooking at the Training School for Cooks and Bakers at Fort Riley, Kansas, until he retired in 1909. Bromwell died on April 2, 1923, in Washington, D.C., and was buried in the Soldiers’ Home National Cemetery. William Frank died on April 6, 1880, in Baltimore, Maryland. He was a Private in Company B who was with the pack train and participated in the hilltop fight. William H. Gilbert married Mary E. Hevener on April 7, 1870. He was a Corporal in Company L who died with Custer’s Column and was buried on Last Stand Hill. Alexander Brown died on April 7, 1884, at Fort Meade, Dakota Territory, and was buried in the National Cemetery there. He was a Sergeant in Company G who was with the pack train and participated in the hilltop fight. William G. Hardy died in San Francisco, California, on April 7, 1919, and was buried in the National Cemetery there, the Presidio. He was a trumpeter in Company A who participated in the valley and hilltop fights. William Alexander was born on April 8, 1838, in Armagh, Ireland. He was a packer with the Quartermaster who was with the pack train and participated in the hilltop fight. John R. Gray was born in Troy, New York, on April 8, 1855 and died on April 30, 1915, in Worcester, Massachusetts. He was a Private in Company B who was not present at the battle due to detached service. Stephen L. Ryan died on April 8, 1885, in Bismarck, Dakota Territory, and was buried in St. Mary’s Cemetery there. He was a Private in Company B who was with the pack train and participated in the hilltop fight.